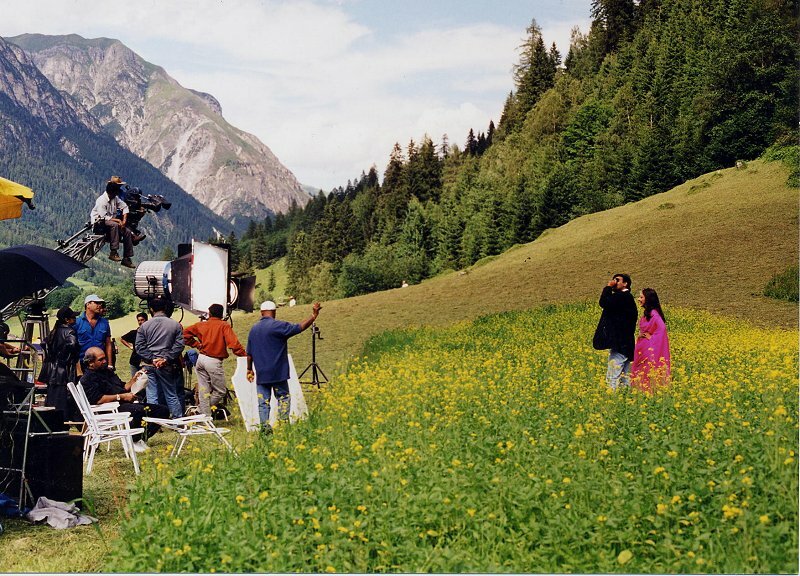 Bollywood and Tirol – a love affair! India has the biggest film industry in the world – more than 1000 features are produced annually, many of them encountering enthusiastic audiences outside India, too. Cine Tirol is a dedicated initiative by the State of Tirol and the Tirol Tourist Board. Since 1998 it has successfully aimed to promote Tirol internationally and professionally as the location in the Heart of the Alps. Previously more than 500 film projects from Austria and abroad have been brought to Tirol: filmmakers from near and far have been convinced of the interesting and attractive production facilities including the Cine Tirol Location Service and the Cine Tirol Production Incentive for selected projects. The spectrum of projects realized ranges from features, TV-movies, TV-series, documentary films and commercials to music videos. The success has led to great attention being recognized by the international film scene as the „land in the mountains“ – not just in the German-speaking area, but far beyond Europe to the powerful film industries of the USA and – India! India has the biggest film industry in the world – more than 1000 features are produced annually, many of them encountering enthusiastic audiences outside India, too. The shooting for these film productions takes place both in India and in other countries with attractive locations, e.g. New Zealand, Australia, the USA, Britain, Switzerland and – since Cine Tirol has been actively involved – also in Tirol. In this way moving and touching images from Tirol reach India and delight millions of cinemagoers there. The fascinating Tirolean mountain world corresponds to the Indian concept of „paradise“ – it stands for beauty, purity and good health. What is more, mountains are regarded as the seat of the Gods in Indian mythology and they thus represent a landscape of desire. Tirol has been presented on several occasions to leading Indian film producers, directors and actors in Mumbai – also known as „Bollywood“ as an acronym of its former name „Bombay“ plus (H)ollywood – as well as in Hyderabad, Chennai and Bangalore. A Cine Tirol promoter has also become established in Mumbai, with his knowledge of Tirolean locations he is able to make personal contact on the spot with producers and directors in this leading Indian film centre. By taking part in trade fairs and location events the attention of the Indian film industry to Tirol has intensified. Successfully indeed – previously more than 85 Indian film productions from Mumbai, Hyderabad, Chennai and Bangalore have been brought to Tirol and supported during the shoot. The features include „Tiger Zinda Hai“, „Yuvvraaj“, „Pardes Mein Hai Mera Dil“, „Raju Chacha“, „Tera Mera Saat Rahen“, „Mehbooba“, „Mast“ and „Action Jackson“ with stars like Salman Khan, Ajay Devgan, Anil Kapoor, Zayed Khan, Kajol, Sonali Bendre, Katrina Kaif, Sonakshi Sinah, Yami Gautam and many more! Film successes have also increased the number of Indian holidaymakers coming to Tirol in the footsteps of their „divine“ film stars. This has in turn prompted the Tirol Tourist Board to intensify Tirol tourism promotion in India. Thanks to participation in selected trade fairs and workshops, sales calls and mailings in the major towns throughout the subcontinent the number of Indian visitors to Tirol has considerably increased in the course of recent years – between 1998 and 2014 by over 700% to 54.324 overnight stays! The following text from Johannes Koeck, head of Cine Tirol, summarises the memorable experiences of working with Indian film productions in Tirol. my name is Mr. Ramesh Babu Valluripalli – I am directing one of the most successful film production companies in India with more than 25 award winning films on our list. We are ready with an exciting new project which we would like to shoot in your country. It is a film to be directed by the famous Indian director Mr. Surrender Reddy Patthi , and features one of the biggest superstar of South India Mr. Tarakarama Rao Nandamuri along with another three major stars from the Indian film industry including the beautiful heroine Anuradha! We intend to start shooting for the film by 11th June and visit Tirol later in the same month. Along with the entire crew of 32 we will bring a cook, an assistant cook, a foreign shoot co-ordinator, an assistant foreign shoot coordinator and the following guests: heroine mother, producer wife, producer son, producer daughter and producer friend. In the recent past, we have seen a number of Indian films being shot at foreign locations and thereby helping the tourism of that place grow almost overnight! Tirol being such a beautiful place would in all probability stand to gain from this collaboration. The project in question will be filmed in English and have a world wide release, thereby increasing the exposure of Tirol to a wider audience. The story has a lot of scope to do justice to a marvel like Tirol and you can be rest assured that from our end we would leave no stone unturned in projecting it in all its glory! In order to take this concern forward, I would require some details pertaining to the facilities and collaboration offered by you at the earliest. Please help me understand how we can take this forward. Do let me know if you require any additional information about the project at this stage. Concerning the further steps in order to establish a fruitful and long lasting co-operation we kindly ask you to do the needful: Thank you! Indian films title Snehana Preethina, Chukkolo Chandrudu, Ishq Hai Tumse, Tera Mera Saath Rahen, Kyaa Dil Ne Kahaa, Chal Mere Bhai, Ela Cheppanu, Preethiyeke Bhoomimelide, translated in the same order mean: Friendship or Love, Moon beneath the Stars, Only Love for You, We will stay together, What your Heart says, Come along Brother, Finding the right Words, Why Love exists on Earth. The title of this film is Tumko Dekha To Yeh Khayal Aaya, which means “The first time I saw you, I knew you were the shadow in my Life”. The last day of filming has arrived – on the way to Munich Airport, the filming of one last surprise scene has been “rescheduled” on the Stubai Glacier. The bus is loaded with boxes, cases and bags, as well as a camera, a tape recorder named Nagara and several costumes. The cable car ride up the mountain results in more astonishment about the “paradisiac beauty” of the mountains, additionally with more and more snow. 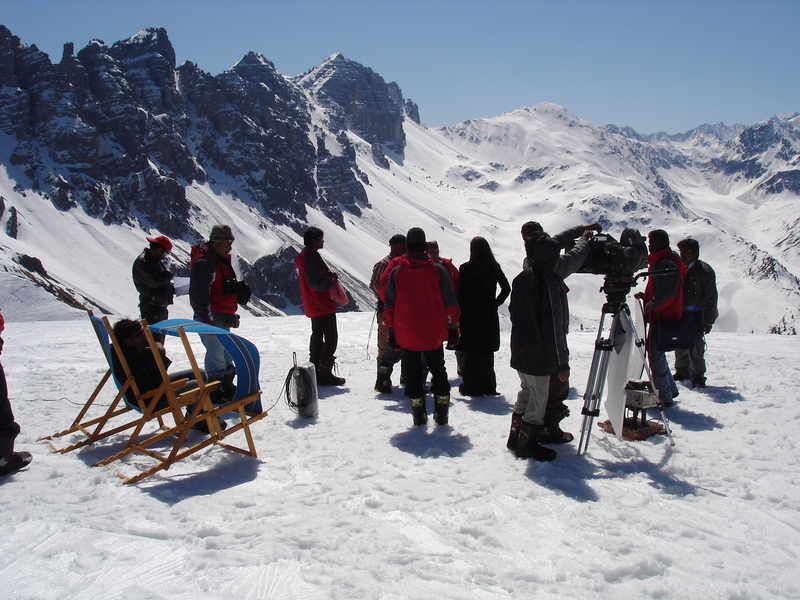 Once arrived at the top, the south Indian filmmakers and all the people, who became a part of the team, take their first steps into the “SNOW!” with twinkling eyes, short breath and despite their light footwear. The second camera assistant Chandrasekar Rao Dandila hands cameraman Krishna Murty Chendil Kumar Kodanpani a piece of styrofoam between his bare feet and the “SNOW!” – he has taken a vow not to wear shoes for an entire year, wherever his feet may carry him! The magic of this moment is again interrupted by the shout of director Surrender Reddy Patthi: “WHERE IS THE COCONUT?” At first the entire team of south Indians looks around, puzzled. After the second “WHERE IS THE COCONUT?” they seem horrified: the coconuts were left at the hotel! Before every day of filming, director Surrender Reddy Patthi smashes a coconut, asking the Indian gods to be kind and gracious! The second production assistant Ramana Reddy Velmala is sent back down into the valley to pick up the coconuts, which a driver from Innsbruck delivers to the valley Stubaital. Two hours later the director declares “HERE IS THE COCONUT!” and shouts “ACTION!” shortly after. We returned home safely. 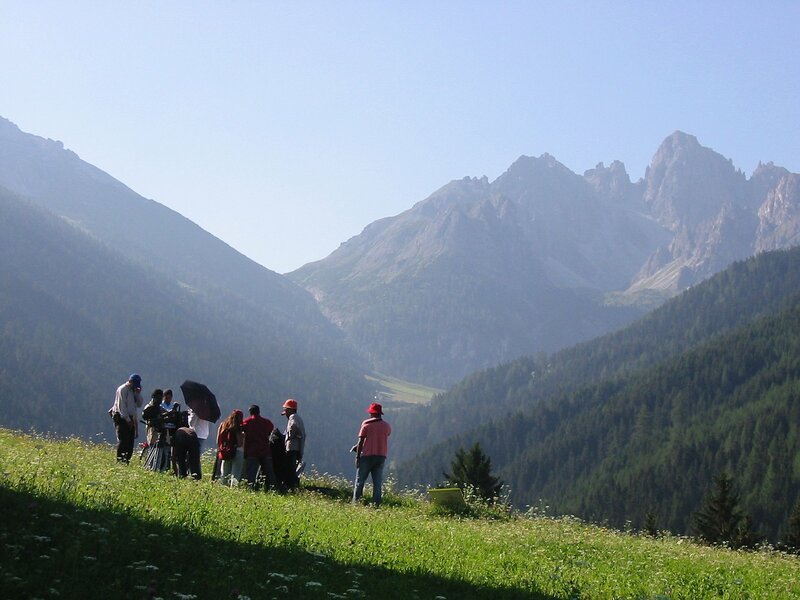 Our shoot in Tirol was excellent – we released the film just recently and it will be a number 1 hit in all India! Tirol is a true paradise – we love your mountains and lakes: we will come back often again and keep shooting! Your help and support was very much appreciated: many thanks!